Not everyone wants to buy branded computers from stores at high prices. Some people who understand computers prefer to buy each computer part separately and then assemble these parts together to build their personal computer. There are many ways in which you can do this. You can go to your nearest computer hardware shop and buy each part separately from the store and bring them home for assembling. Or you can source these parts online from websites like PCPartPicker. There are many online stores where you can go looking for these parts. If you want to search separately for each part, each individual part would be available on the website of their manufacturers. For example, you can find intel chips at Intel website and shop from them or their partners. All the parts would similarly be available at individual websites. You can also go to a single website that lists all these parts. Websites like PCPartPicker help you here. PCPartPicker is a website that provides expert computer users the option to choose parts for their computers. It has a variety of selection, compatibility and pricing guidance for those who want to assemble their own computers. Users who want to build their own personal computer can go to PCPartPicker and assemble their virtual parts at one place. PCPartPicker will then provide the user with guidance regarding the compatibility of these parts with each other. The website will also provide the user with guidance on the up to date pricing of these parts. To do this, the website will scour dozens of the most popular online retailers who stock these parts. Not only can the user build his own virtual assembly here, but he can also share his part list with others. The website also has various community forums that are an excellent place for expert computer users to discuss their ideas and take feedback on the same from other expert users. Users can make their own part lists. Each PC requires many different parts that need to be compatible with each other to work at their optimum capacity. 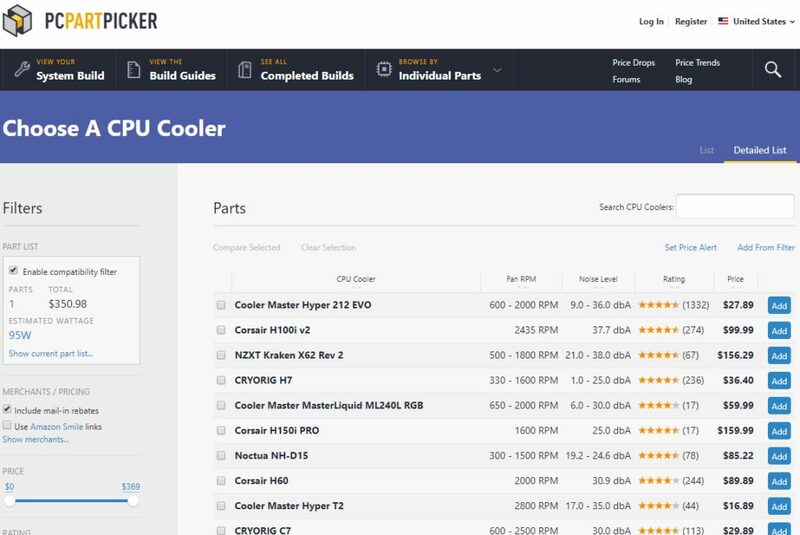 PCPartPicker helps you keep a track of parts you have selected by letting you create a part list that you want to purchase to build your own personal computer. These part lists can also be broken down into various filterable categories. As some parts have many components within that part, this can be really useful. For example, the motherboard consists of the processor, the motherboard itself, the RAM, the GPU, etc. The option to make separate filterable categories becomes very useful here. In order to build your part list, you must first go to the homepage. It can be found at PC Part Picker website. Once you are on the homepage, you should next click on the first option near the top where there generally is a menu bar. Click on the Start A System Build option, as can be seen in the below image. Next, you will see the option to select various components for your PC. You will find the option to select a CPU, a CPU Cooler, a Motherboard, the memory, the storage device or devices, the Video Card, the case, the power supply, the optical drive, the operating system, the various software, the monitor, any external storage and so on. The user has various option to choose from inside each of these options. One of the most common problems a new user faces when trying to assemble his or her own personal computer is that of finding compatible parts for their computer. A certain software may not work with a certain kind of hardware. The chosen memory device may not be compatible with the motherboard. The chosen CPU cooler may not be powerful enough to keep your CPU cool. There can be many such issues that you may face when you try to assemble the computer yourself. Wouldn’t it be great then if there was a place that would let you choose only those parts that are compatible with parts already on your list? 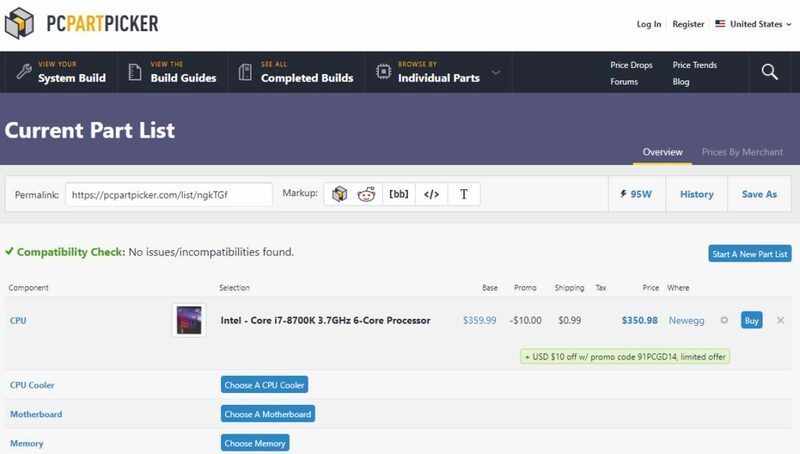 PCPartPicker has automatic compatibility guideline which doesn’t let users add parts to their list which are not compatible with already chosen parts. So, if, for example, you have a CPU that needs heavy cooling, you will only be shown CPU coolers which have sufficient power for the necessary job. If you do decide to pick some parts that are incompatible with other parts, the website will give you warning about the same. Overall, this is a very helpful feature for those who are new at assembling their own personal computers and don’t have much idea about whether part X is compatible with part Y. Sometimes, it is not enough that you have created a list of parts for your next personal computer. You may not find this to be enough. What if the system doesn’t know if the list really is compatible? What if your friend is an expert and you never purchase any parts without consulting him first? Worry not. PCPartPicker allows you to share your lists with others. The sharing option allows you to share your list on twitter, facebook, etc. You can also create a permalink and give the link to anyone you want to. They can simply click on the link and come to your list. There, they can review your list and advice you on the compatibility of the list. PCPartPicker also auto-generates markup text in case you want to share the list to Reddit and other such forums. Sometimes, you plan for your personal computer in advance. Many people plan to purchase their electronics during Black Friday, Christmas or Diwali. They get the best discounts during these times. But, how will you keep track of the prices of all the parts? How will you know whether you are really saving on the purchases or not? PCPartPicker allows you to keep a track of the prices of the different parts that you have on your list. It scours dozens of the most popular websites on the internet where these parts are being sold and regularly updates you about the price of these parts. PCPartPicker also lets you configure the shipping costs and mail in rebates. You can also put in the pre-retailer tax according to what you will be spending and the website will show you the final price. PCPartPicker will also show you a price history chart for each part that you have on your list. This will show you whether it was a good idea to wait for some time and let the prices of the parts fall or whether you are now paying more because you waited. You can also see historical price performance for the whole list at once. So, you have set a certain price threshold for each part and want to wait until the prices fall below that threshold. But you cannot keep checking the prices for each and every part. How are you supposed to manage this? PCPartPicker helps here too. You can set a threshold for each and every item and PCPartPicker will alert you whenever the price of any item drops below this threshold. PCPartPicker will send you an email with the details about the item and the new price. You can also set a price threshold on the entire product category if you want to pay a certain amount for the whole category and are not that concerned with each individual unit. These thresholds are saved and the algorithms keep working in the background of PCPartPicker to find out when the price threshold has been met. This is a very helpful feature for those who want to buy a personal computer within their preset budget. This feature can also help when you have lots of time on your hand and are not in the urgent need of a personal computer. With enough time on your hand, you can wait for the prices to fall. With PCPartPicker, you can also be at ease as the website is doing your job by tracking the prices of various parts and product categories for you. PCPartPicker also has a thriving community of other users who are experts on assembling personal computers. Sometimes, it is helpful to ask others about whether your list is missing something or whether you will really be getting the powerful machine that you are trying to build. Without someone to guide, you may make a mistake and but an incompatible part trying to save some bucks. There are tons of forums on PCPartPicker where you can discuss with many like-minded people on whether the part list you have made is good or not. You can share your part list on the forum and get feedback from many users there. You can also find other user’s posts about their own completed parts lists. This can be helpful for those who want to build a part list but are too lazy or not sure which parts they should pick. In order for you to make a list on PCPartPicker, you must first go on the website’s homepage and select on the Start a System Build button, as shown in the image below. Then, you will find a screen where you must select each and every part that you want for your personal computer. As you can see in the image above, you can select each and every component. The website will show you the image and the description of the part. It will also show you the base price of the part along with any promo, if available. The website also shows you the shipping cost that you will incur within their set terms and geographical limits. It will then finally show you the total cost that you will incur to buy that part. In the last column, you will also see the website from where you can get the product at this price. If you are okay with all these, you can click on the buy button. 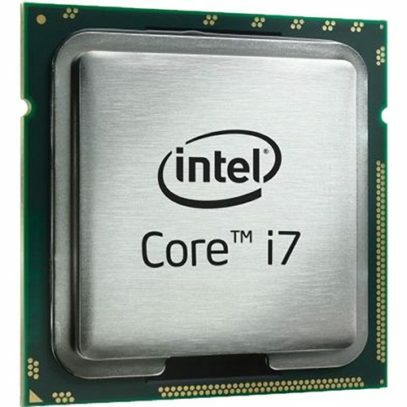 In the example above, we selected Intel’s Core i7 8700K which has a processor speed of 3.7GHz and has a 6 core processor. As can be seen in the image above, the base price for this processor comes to $359.99 and there is a promo available that gives me a discount of 10 dollars. The promo code 91PCGD14 is already applied for our benefit and the website shows that this promo code is available for a limited time only. The shipping cost shown is 0.99 dollars. Total cost comes to $350.98 and this price is available on Newegg website. Similarly, you can select each and every part by clicking on the options given. For example, if you want to select a CPU cooler, you can click on the ‘Choose a CPU Cooler’ button. It will then take you to a page where there are many options available for you to select from. As you can see above, the page will show you many options to choose from. Here, you will be shown different options with their features and ratings by other users. For example, Cooler Master Hyder 212 EVO is the first option that you will see. As you can see, the cooler has a Fan RPM of 600 to 2000. The noise level also ranges from 9 decibels to 36 decibels. Overall, this has a rating of about 4.5 out of 5 stars and has been reviewed over 1300 times. The price of the part is 27.89 dollars. With these details available, it becomes easy for you to judge which part should be the best option for you. If you are happy with the features and the reviews, you can click on the Add button to select the part as your CPU Cooler. On the left-hand side, you can see that the ‘Enable Compatibility Filter’ option is available. When this option is selected, you will only be shown parts that are compatible with previously selected parts in your part list. If you are sure that there’s a part you are missing and that it actually is compatible, you can turn this option off and select the part. However, generally, the website gives a very good recommendation on whether a part is compatible or not. When your part list is complete, you can buy each part individually from the website that gives you the best rates on them. The website itself makes money when you purchase any item for your computer from any store. They are affiliates to all these websites and they earn commission on each sale. They can then use this money to keep the website running. 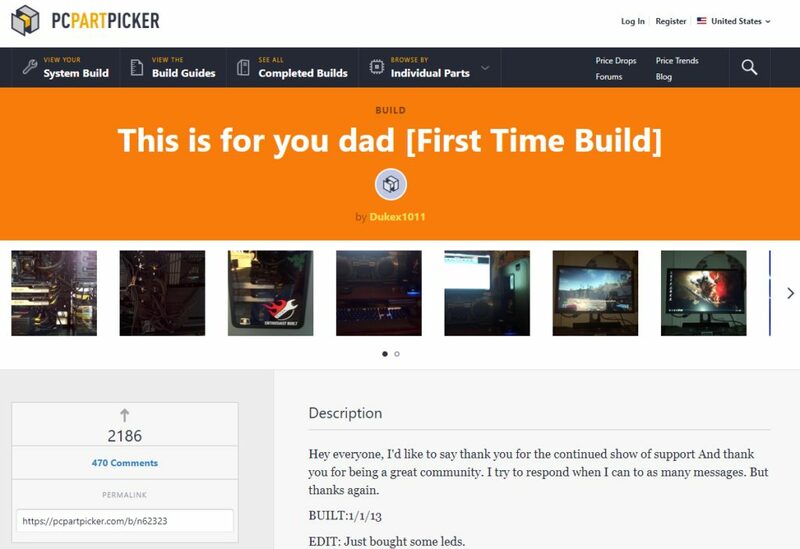 PCPartPicker also has the build guide for users who want to make their own personal computer. At the top of the menu, you can see the option ‘View the Build Guides’. Click on the same to get to the build guides section. To build your own guide, you need to be a member of the website. You cannot build a guide without being part of the website. However, you can view the guides built by other users. This section helps you build a specific kind of personal computer. 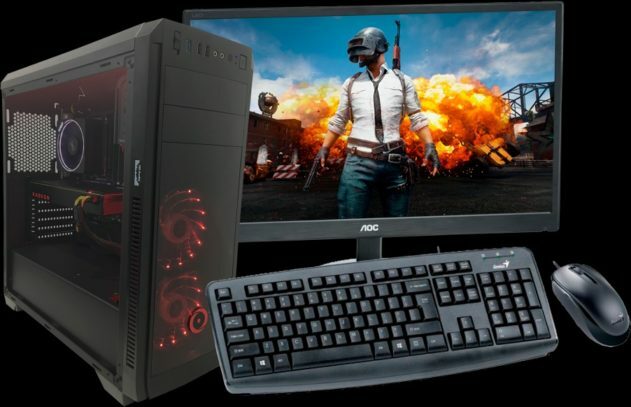 For example, if you are looking to build an entry-level gaming computer with Intel chipset, you can select the guide titled ‘Entry Level Intel Gaming build’. On that page, you can see that the guide builder has explained which part you should pick and why. For example, in the Entry Level Intel Gaming build, the guide creator recommends that you go with Intel Pentium Gold G5400 CPU. He then explains why you should do the same. Also Read: coke and popcorn. The user recommends different parts for each part requirement and explains his choice. There are many other such guides depending on your requirement. If you want an advanced gaming computer, you can find many such setup guides by different users. At the end of the guide, you will see the complete part list with the price for each and every part. The list also has the price for each item along with the reviews by other users for each part. You can directly click on the buy button from the guide itself. If you feel that you can make a better guide, you can become a member of the website and create your own guide for other users to follow. You can also view already completed lists by other users on the website and choose to buy the same if you think you want a similar personal computer. To see this, you should click on the ‘See All Completed Builds’ button near the top of the screen. There, you can see the different lists built by other users. We can sort the lists by rating or by price or by recentness. In order to see the best PCPartPicker list, we will sort by the highest rated option. We see that the list ‘This is for you dad’ has over 2000 likes from other experts and this is the best list on the website. Let us have a look at what the user has put in his list. The user has selected the below parts in his list. RAZER HEADPHONE TIAMAT ELITE 7. The total cost for the setup comes to about $1916.78. There are other users who have shared their own lists, but this is the best list on PCPartPicker. PCPartPicker also has a section dedicated to parts whose prices have dropped, for any reason. This is very useful for those who don’t have a list ready yet but want to know whether some parts are available at a cheap price. You can visit the price drop section by clicking on this link. There is an option to look at the price drop in the last 24 hours and to look at the price drop in the last 7 days. As you can see in the image above, Intel Core i9 is available for a 12% cheaper price than the base rate. 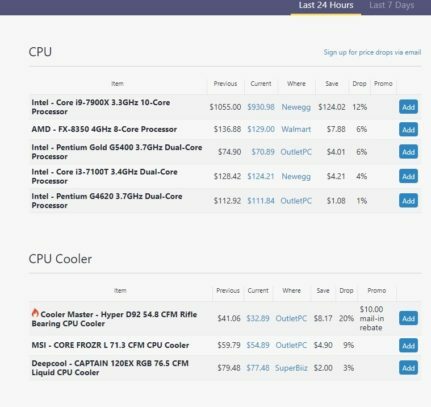 PCPartPicker is one of the best websites where you can select parts for your personal computer, track their prices, check the compatibility of each part with the previously selected parts, share list with other users, and so on. This is very helpful for those who want to build their own personal computer without having to spend a lot of money on branded computers. With the price alerts, price drop section and price trend section, even shoppers who want a steal have many options to get the computer they want to build at the lowest possible price. What do you think about this article? Did we help you understand more about PCPartPicker? How did you come to know about PCPartPicker? Have you built a list on the website yet? Share your comments with us in the comment section below. You can also check the following video about how to use PCPartPicker.